I found a little animal in my driveway, curled up just like this. Dirty, malnourished and frightened, she fought me with vigor all the way back to the screened porch. She turned down the offer of dry kibble, but inhaled the canned tuna I brought her. She was very tiny, but managed to eat half a can of the fish. The vet said she was about five weeks old. The kitten’s pitiful cries did not draw a searching mother cat from the woods. I didn’t really think the mom was around, but I had to try. 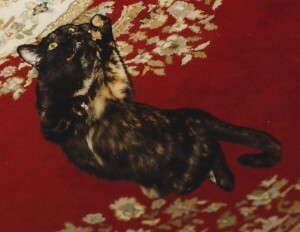 The kitten was too skinny, too dirty to have been recently cared for by her mother. As she had an injury to her mouth, I wondered if the mother had died trying to protect her kitten, who had somehow escaped. She clearly would not have lived much longer if she hadn’t been rescued by me. There were foxes and birds of prey all over the place. She wouldn’t have had a chance if one of them decided she would be a tasty snack. At first, she was terrified of me. 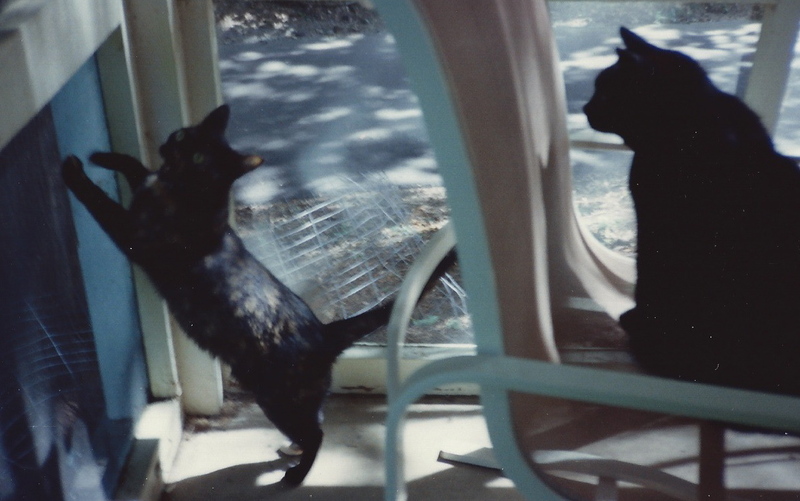 When I would go out to visit her on the porch, she would run away from me, fleeing as if her very life was at stake, hiding cornered behind a potted plant until I would pick her up and hold her. I would talk and sing to her until she fell asleep. 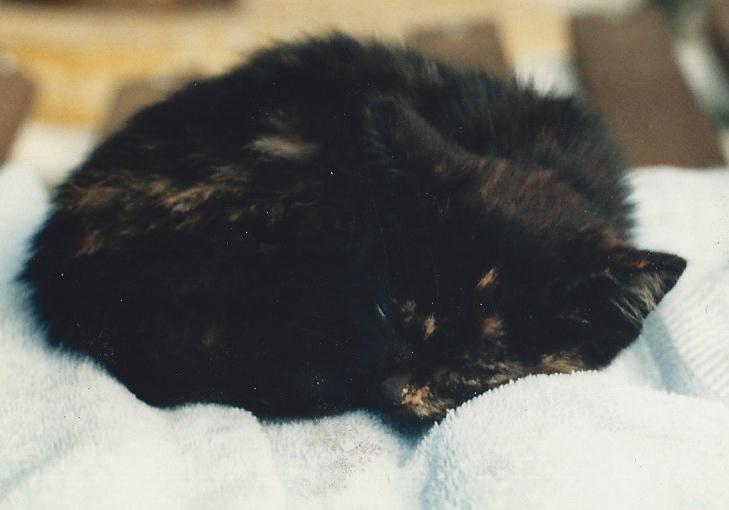 I would put her on a towel on the porch swing and leave her there to dream her kitty dreams, thinking that next time she would not run away from me. But she did. On the fifth day, she ran and hid but it slowly dawned on me that she was running not in fear, but in play! That was when we started to bond. We played games of chase and tag until she was two or so and decided that tag was kitten stuff. 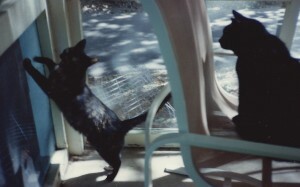 Samantha loved having my other cat, Sebastian, as a mentor and he was happy to have a friend. They would play and wrestle around and chase, then curl up together so you couldn’t tell where one cat ended and the other began. After a cuddly nap, they would start the play/wrestle/chase cycle all over again. Samantha and Sebastian were best friends for nine years, until he succumbed to kidney failure in June, 2001 at the age of fourteen. 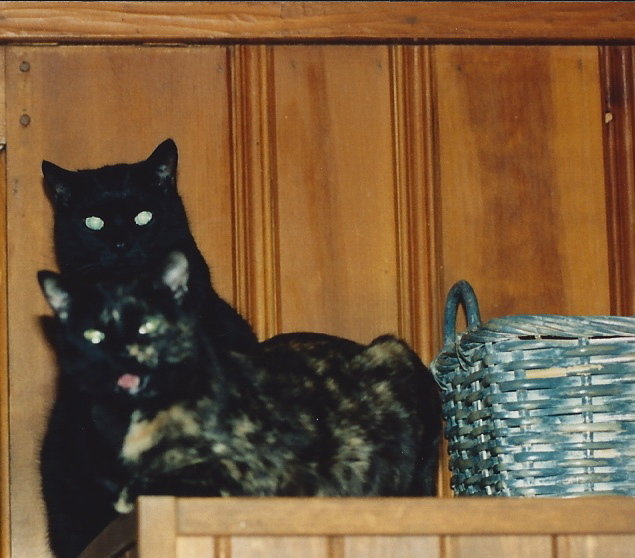 Samantha was with me for another ten and a half years, calmly accepting the arrival of four other adult cats and more than twenty foster kittens. Some of the kittens stayed with us, but most found other good homes. 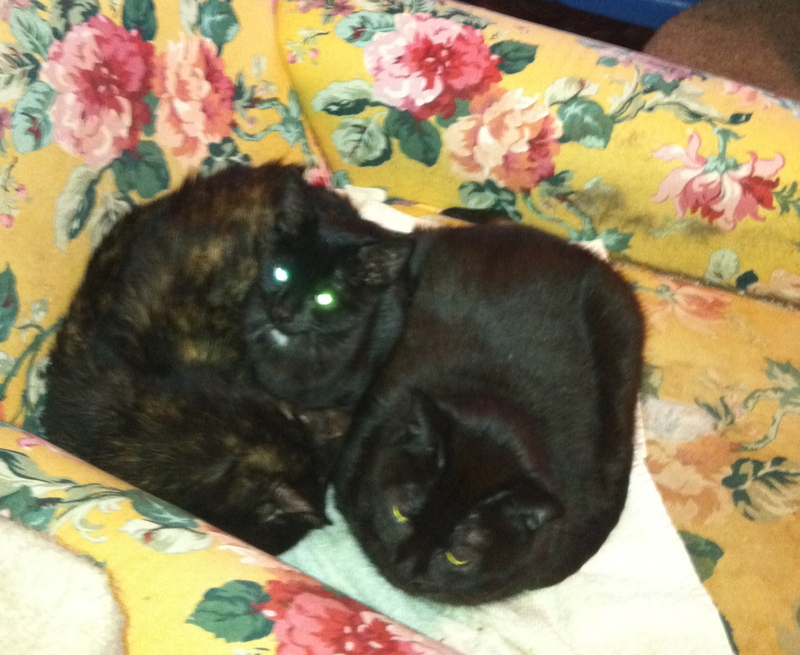 She was a particularly good mother figure to Monty, allowing the kitten to curl up with her. Perhaps they shared stories of being taken from their mothers at too early an age. Maybe she told him all the best ways to wrap me around their little cat’s fingers. Maybe they just snored in unison. Samantha was not a demanding cat, unless she was hungry. Then her little high-pitched meow was unrelenting until the kibble bowl was refilled or I brought out a can of Wellness chicken or turkey. Last November, Sam was diagnosed with mast cell sarcoma. With medication and love, she held on for another couple of months, with the same sweet nature she had radiated her entire life, but she took a turn for the worse in early February. I held her as she was euthanized on February 6, 2012. She was nineteen and a half years old. Such a loving, calm girl. Such a large part of my life for such a long, long time. I miss her every day. The cats seemed confused when she was suddenly gone, but they eventually established new patterns, new relationships. I still look at her battered, overstuffed, yellow chair and expect to see dear Samantha in it, watching for me. 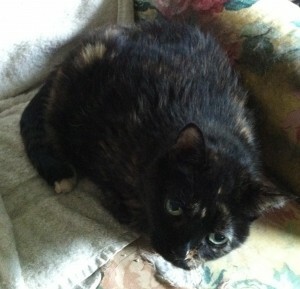 This entry was posted in Cat stories by Celayne. Bookmark the permalink. Sweet kitty! Love the photos & the blog! The worst part of loving and animal is when they go. It is hard, but eventually all you think of is the funny and loving things they did.